A US customer previously purchased a 2” solar powered PetroXtractor™ as part of its groundwater remediation system. The unit was being used in desert like conditions to pull oil from a well. Although the PetroXtractor was successfully remediating the oil from the well, the facility was having problems with the environment affecting the process. Sand was getting blown in and onto the belt and was mixing with the retained oil. After contacting Abanaki for a solution, it was decided that the company would benefit from utilizing a vapor tight model. Typically, Abanaki doesn’t offer the vapor tight model with the solar powered kit. However, since the problem at hand in this particular application wasn’t about keeping vapors in, but rather keeping debris out, the vapor tight was the ideal solution. 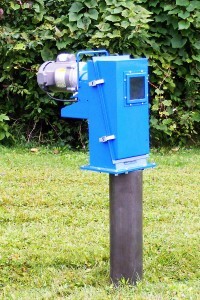 The vapor tight unit features an enclosure around the belt that goes down into the well. This helps in keeping the sand and debris from reaching the belt, and mixing with the oil. With the new addition of the vapor tight option with its solar powered PetroXtractor kit, the company’s operation is now operating smoothly.